On a largely party-line vote the state Senate voted 17-13 Wednesday to approve a list of questions about the reasons for deciding to terminate a pregnancy. A letter sent to committee members Wednesday by Republican Sen. Kimberly Yee says she will dismiss the complaint against Sen. Catherine Miranda unless two other members object. The move comes after the state attorney general's office found no evidence Miranda knowingly broke the law or misrepresented herself to voters signing the petition. The Arizona Attorney General’s Office will not pursue criminal charges related to alleged petition signature fraud against Sen. Catherine Miranda, according to a letter from Assistant Attorney General Todd Lawson. Arizona senators approved a bill that would override contracts that couples agree to when undergoing fertility treatment. Arizona state Sen. Catherine Miranda is running for Congress against a fellow Democrat, U.S. Rep. Ruben Gallego. The Arizona Senate Ethics Committee will investigate a Democratic state senator for allegedly violating signature gathering laws, but won’t do any real sleuthing until the attorney general weighs in. 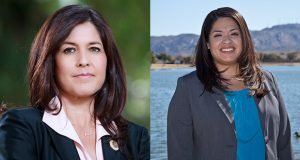 The family reunion might be a little awkward this year: Incumbent Democratic Sen. Catherine Miranda is defeating her stepdaughter, Maritza Miranda Saenz, in the Legislative District 27 Senate Democratic primary. The Democratic primary for a southwest Phoenix district’s seat in the state Senate is a family affair. The challenger is a hungry newcomer looking to strip the title of senator from the defending incumbent: her stepmother.